^ 2004年3月2日報文 (TXT). Mtarchive Data Server. 愛荷華州立大學. ^ Gafilo. Saison cyclonique Sud-Ouest de l’océan Indien, 2003–2004. 法國氣象局. 2006: 62. ISBN 2951166583. ^ 2004年3月3日報文 (TXT). Mtarchive Data Server. 愛荷華州立大學. ^ 2004年3月4日報文 (TXT). Mtarchive Data Server. 愛荷華州立大學. ^ 2004年3月5日報文 (TXT). Mtarchive Data Server. 愛荷華州立大學. ^ Gafilo. Saison cyclonique Sud-Ouest de l’océan Indien, 2003–2004. 法國氣象局. 2006: 63, 66. ISBN 2951166583. ^ 2004年3月6日報文 (TXT). Mtarchive Data Server. 愛荷華州立大學. ^ Gafilo. Saison cyclonique Sud-Ouest de l’océan Indien, 2003–2004. 法國氣象局. 2006: 65. ISBN 2951166583. ^ 2004年3月7日報文 (TXT). Mtarchive Data Server. 愛荷華州立大學. ^ 10.0 10.1 10.2 10.3 10.4 Gafilo. Saison cyclonique Sud-Ouest de l’océan Indien, 2003–2004. Météo-France. 2006: 68, 69. ISBN 2951166583. ^ 2004年3月8日報文 (TXT). Mtarchive Data Server. 愛荷華州立大學. ^ 2004年3月9日報文 (TXT). Mtarchive Data Server. 愛荷華州立大學. ^ 2004年3月12日報文 (TXT). Mtarchive Data Server. 愛荷華州立大學. ^ 2004年3月13日報文 (TXT). Mtarchive Data Server. 愛荷華州立大學. ^ 2004年3月14日報文 (TXT). Mtarchive Data Server. 愛荷華州立大學. ^ 2004年3月15日報文 (TXT). Mtarchive Data Server. 愛荷華州立大學. ^ Gafilo. Saison cyclonique Sud-Ouest de l’océan Indien, 2003–2004. 法國氣象局. 2006: 70–72. ISBN 2951166583. ^ 18.0 18.1 International Federation of Red Cross And Red Crescent Societies. 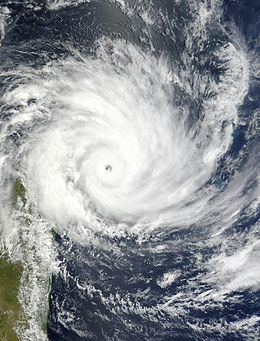 Madagascar: Cyclone Gafilo (PDF). ReliefWeb. 2004年3月17日 [2013年5月6日]. ^ International Federation of Red Cross And Red Crescent Societies. Madagascar: Cyclone Gafilo, Final Report, Appeal 08/04. ReliefWeb. 2005年5月25日 [2011年3月31日]. ^ Gafilo. Saison cyclonique Sud-Ouest de l’océan Indien, 2003–2004. 法國氣象局. 2006: 63, 67. ISBN 2951166583. ^ Patel, E.R. Logging of Rare Rosewood and Palisandre (Dalbergia spp.) within Marojejy National Park, Madagascar (PDF). Madagascar Conservation & Development. 2007年12月, 2 (1): 103–112. （原始内容 (PDF)存档于2012-11-12）. ^ Marojejy National Parks – News Updates. 馬洛傑基國家公園. 2009年11月 [2010年2月4日]. ^ 24.0 24.1 Gerety, Rowan Moore. Major international banks, shipping companies, and consumers play key role in Madagascar's logging crisis. WildMadagascar.org. 2009年12月16日 [2010年1月29日]. 2004年3月2-15日報文. Mtarchive Data Server. 愛荷華州立大學. Padgett, Gary. Monthly Global Tropical Cyclone Summary March 2004. Tropical Cyclones. Australian Severe Weather. [2013年4月29日].